Zensah Long Sleeve Compression Shirt is the most advanced compression shirt available. Featuring Zensah's innovative compression technology, the compression shirt helps to decrease muscle recovery time, provides muscle stabilization to prevent injury, and improve blood flow. The long sleeve compression shirt is seamless, so it does not have any tags or seams to cause irritation or chafing. The shirt contains silver ions to provide thermal regulation - keeping your body at the perfect temperature. It is made in Italy of a blend of polyamide and polyester fabric and is ultra-soft. Anti-odor technology in the shirt prevent the build of bacteria while wearing the shirt, allowing it to stay feeling fresh. 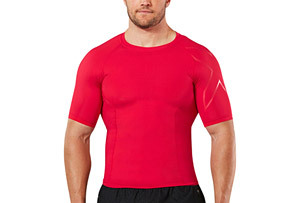 The compression shirt will keep it shape over many uses and washes.